I finally got my SWAGs. Hooked them up in series to one channel of my 100w Sherwood for a few hours while I had some other projects to work on. Once the tweeters "warm up" they are nice. Not as nice as my JBL's, but I digress. A/B'ed them against my Polk audio db's...sure they are louder, but don't sound as good. They get that horrible voice resonance fart-out at high volume, when the Polks keep going. Tried messing with the EQ and curves... Guess they're not going in the Jeep doors - I'll keep my water-logged $60 Polks in there. The baskets are HUGE and won't fit into any OEM 6.5" location, so fabrication is to be expected. I figured I would put them into the rear shelf in my Corolla...not without cutting, even with the JBL/Infinity adapters! Seriously considering 'glassing a whole new panel just to make them work somewhere. These definitely need power, not just a head unit. Still haven't gotten parameters from EMF, but .6 cubes should be enough for each driver, right? I can probably get a little more with an enclosure the size of the panel. I can really use more midbass. Disclaimer: this is not a bashing against EMF - I'm not done yet, and I need to make these work. I'm sure it's just me, or the speakers haven't fully broken-in yet, or something silly. For a 6.5 .6 cu ft is quite large. Usually sealed for a 6.5 you'd be looking .3 to .4 cu ft and that will usually give you decent extention down low. But I guess it depends on how you want to run it. More like a midbass I'd go slightly larger as you will be able to gain some in the lower range. As a midrange driver I'd go smaller. Ya won't dig as deep but it's a 6.5 inch driver. Don't expect it to. Also let them burn in. You'd be supprised that issue may work itself out. Plus seeing they are Power hungry some more juice may help reinforce the low end and Balance that out. I wouldn't expect much out of emf products. Especially considering the owner. These things are almost monsters! I think I'll be able to squeeze them into about .25-.3 after looking at the panel and my view out the back window. 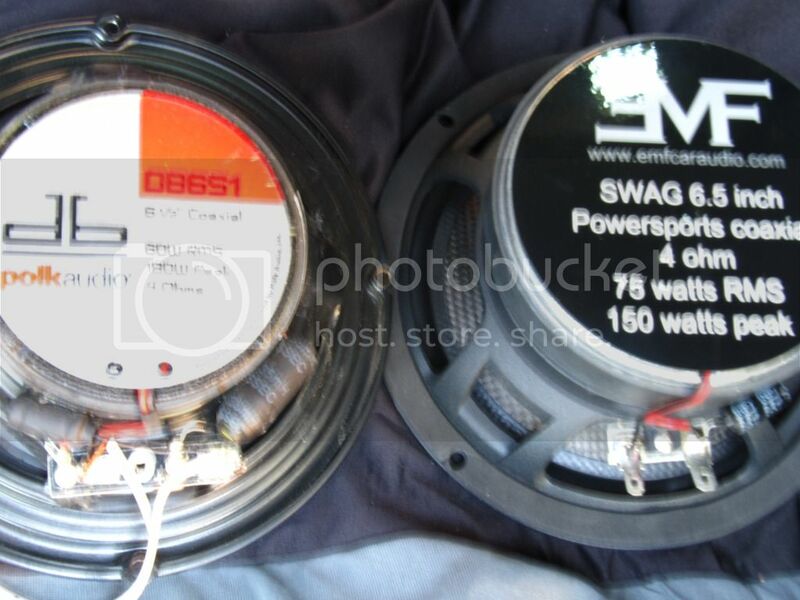 I've got some test boxes I made for some 6.5" 2-ways that are around .26 cubes that were too small to get a decent bass response out of - maybe the right environment for the SWAGs? GOTTA MAKE 'EM WORK!!! Sent "EMF" a message asking the cap frequency for the tweeter so I can add an inductor to get the woofer to STFU and play nice. If "that guy" is reading this here, please reply before I guess at it. Probably need a cap to cure the fart-out on vocals. They handle power nicely. If I can get them tamed, the midbass is there waiting for more power - I can almost hear it with the sub turned off. the back deck will be perfect for the tweeters at that volume; "EMF" said that they would need to be flattened at high volume. Gonna try my 2nd order 4k networks. EMF said 5-8k. I'm almost done wasting time on these; hopefully this relieves some of the pain. I may just cut some metal out of the rear shelf to fit the baskets, cut some rings, and be DONE. 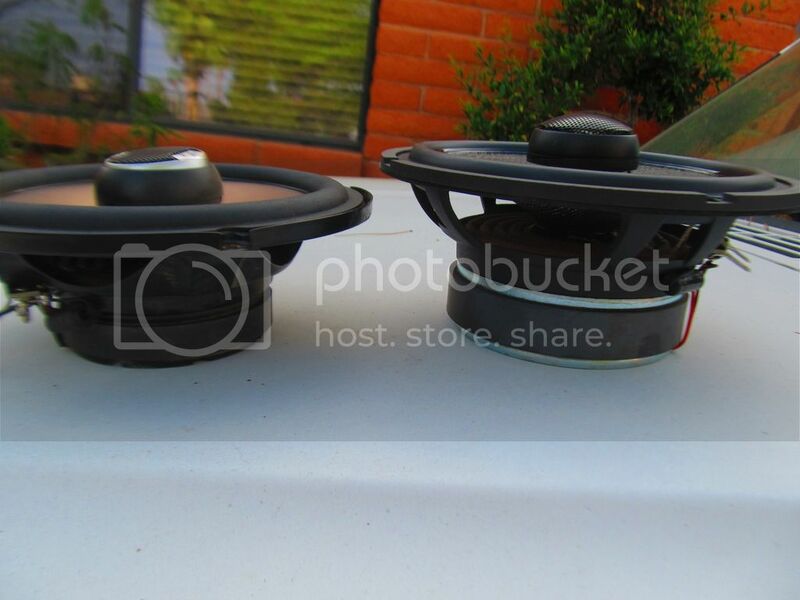 Oh yeah, and the stock speakers are great, but the SWAGs go lower and handle TONS more power. Damn, Ive been a little weary of EMF since I first checked out their website and cant seem to find good specs on EMF products. Apparently, I'm the only customer who had a problem. All the Facebook posts, including the ones I posted comments in are gone. Hmmm. EMF wouldn't give me the parameters - must be some huge secret, there's slopes and specs I wouldn't understand. It's my install...er...all my installs that made them sound bad, including the free-air comparison, and all my EQ settings and all the gear that I tried these speakers on - all bad. I don't know what I'm doing. I tried selling them "New in box" for $100 obo - nobody will touch them. I've been out of work for 2 weeks and need money.